Commentary: I drew the short straw with Tobias Beckett, as his left hand had fingers fused together. Based on pictures I've seen, I assume I just got lucky - I had to separate them with a blade. Once the surgery was complete, I'd say this is a good figure. The 6-inch one is better, but I like what we got here. 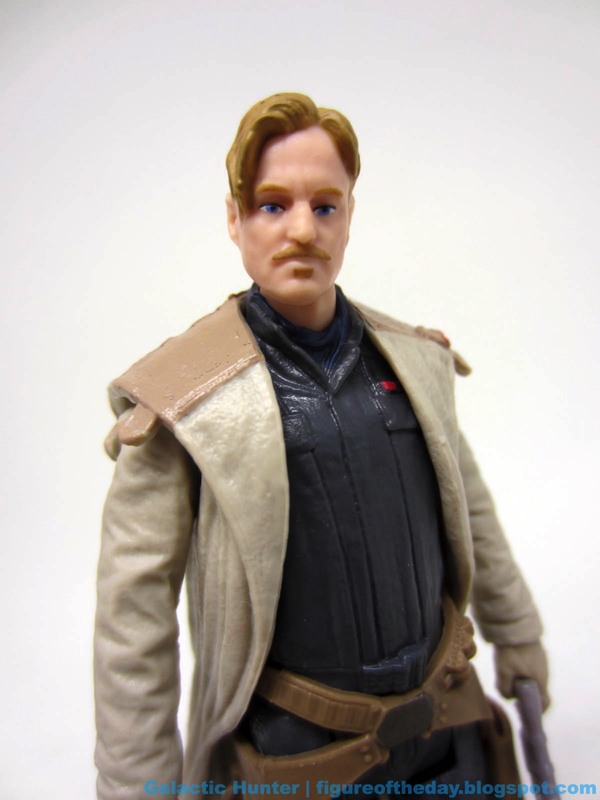 Unlike the real Woody Harrelson, his hair is molded to his head. The facial hair looks good, and the gunslinger motif comes off well with the space duster and space guns. 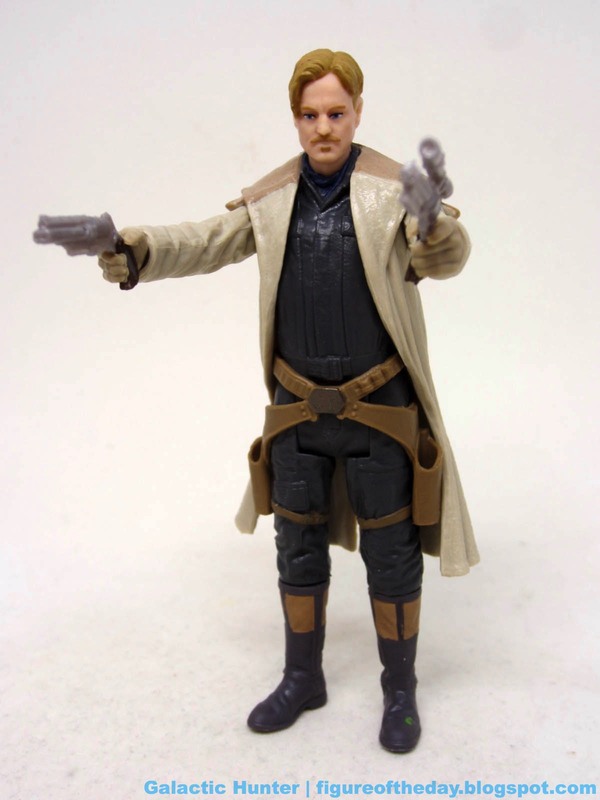 They fit in his holsters, and also his hands provided your fingers aren't stuck together. Woody has 9 joints, thanks to the swiveling wrists and boots augmenting the neck, shoulders, and hips. The holsters do a good job of hindering leg movement, but this isn't a figure you're likely to have sit in something anyway. It's not like the Millennium Falcon was generous with chairs in its 2018 incarnation. The swivel boots are great for getting the figure's stance right, allowing him to have a little adjustment in terms of how you can pose him when finding his center of gravity. I can't say the deco is overwhelmingly memorable, or bad. A few dots are painted here and there, there's paint on the boots, the gloves are nice, the holster has a painted buckle, and the textures aren't anything special. The folds in the coat are nice, but I wouldn't say any one element stands out as being particularly impressive. It's just generally good, decidedly average, the kind of figure you'll get, nod approvingly, place on a shelf, and then forget about. My main reason for recommending this figure is because of the actor, less than the perfectly fine character. I've enjoyed seeing various character actors and big stars salted in to the Star Wars films, and it's weird to think that my one big chance at a John C. Reilly toy will be if Marvel or Lucasfilm give him a big enough role to warrant getting some sort of toy. But hey, here we are, it'd Woody Harrelson as a space cowboy! I'm glad he got made as he was one of Solo: A Star Wars Story's big guns. If you have a shot at him, be sure to get yourself one. Force Link 2.0 Notes: "I have one rule. Do not improvise." "You gotta learn to think five moves ahead." "Assume everyone will betray you. You'll never be disappointed." "There's a lesson to be learned here." "Stick to the plan." "Great shot." Blaster sounds. If it's a soundalike on most of these, it's a very good one.